In the week of July 13, 1665, 700 people died of the plague in the city of London, according to Samuel Pepys, who also had a merry discussion with Lady Slaning about their mutual fondness for brown bread and cream. It’s not known whether the hefty pearls really dangled from Pocahontas’ ears or not, but for Bly Straube, curator of the Jamestown Rediscovery project in the USA, the circumstantial evidence provides a decent case. To start with pearls were often worn by Native American nobility, yet this pair has silver rims with steel point inlays, which suggests they were set in England. However, we do know that while imprisoned in the Tower of London the Earl of Northumberland repaired some earrings for Pocahontas. "In 1866 a new bride of the Rolfe family was presented with them," Bly told the 24 Hour Museum, "and told that they were handed down through the generations and had been Pocahontas’ earrings." One of the most elaborate star forts was constructed in Bourtange, Netherlands, in the sixteenth century. The popularity of star forts did not long outlast the nineteenth-century invention of the exploding shell -- although there is a nineteenth-century star fort in Japan, constructed during the Tokugawa shogunate. I found the map of Zamosc at a very extensive and fascinating website called Historic Cities. Students researching a new display of Tudor portraits in the collection of the National Portrait Gallery have uncovered a ghost figure, which may be Shakespeare's only known patron, Henry Wriothesley, 3rd Earl of Southampton. The discovery was made when the portrait was x-rayed for a display of portraits at the National Trust property Montacute House, Somerset, curated by students from Bristol University. The portrait had been subsequently painted over with a portrait of Elizabeth Vernon, Southampton's wife, by the unknown artist, possibly because a commission for a double portrait of husband and wife was abandoned in favour of the single portrait seen today. A favourite of Elizabeth I, Henry Wriothesley, (1573 -1624), was the only known patron of Shakespeare, who dedicated his poem Venus and Adonis to him (1593). 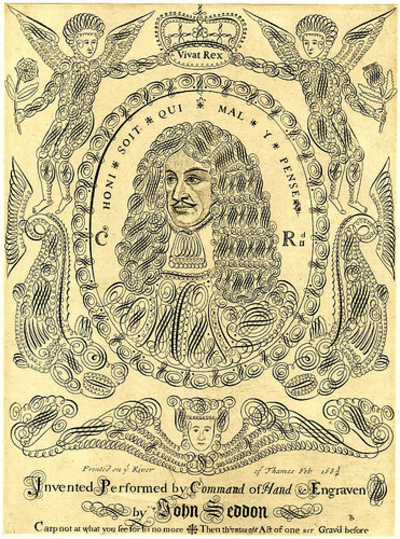 [August 18, 1667] . . . but being weary, turned into St Dunstan's church, where I hear an able sermon of the minister of the place. And stood by a pretty, modest maid, whom I did labour to take by the hand and the body; but she would not, but got further and further from me, and at last I could perceive her to take pins out of her pocket to prick me if I should touch her again, which seeing, I did forbear, and was glad I did espy her design. And then I fell to gaze upon another pretty maid in a pew close to me, and she on me; and I did go about to take her by the hand, which she suffered a little and then withdrew. 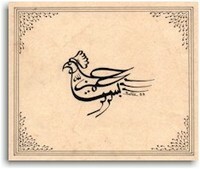 Caption: The script means "In the name of God" and forms a bird; its neckband reads O Merciful, O Compassionate." Family in the Reign of James I"